A Catskill institution returns to Bridge Street Theatre for yet another “farewell” performance. Flo Hayle’s previous cabaret shows for BST – “I Feel Some Songs Comin’ On”, “No Biz Like Show Biz”, and “Encores!” – have raised the roof and packed the house with their combination of old songs, new songs, and tales from her theatrical past. 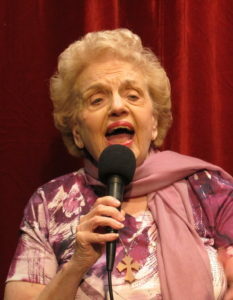 Now she celebrates the approach of her 90th Birthday (on April 22) with an all-new show called “Life Happens”, produced by Jan Grice and accompanied (as always) by the supremely gifted Jay Kerr.